From the moment Omar al-Bashir’s plane landed on South African soil there was always going to be trouble: diplomatic trouble; legal trouble; public relations trouble. 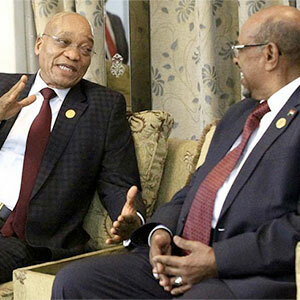 And in his whirlwind visit to South Africa, the Sudanese president certainly delivered on that expectation. His surprise attendance at the 25th African Union (AU) Summit in South Africa – a country which has hitherto been a committed signatory to the Rome Statute – raised serious questions about the International Criminal Court (ICC), and the future of international justice in Africa. But really the biggest questions were about South Africa itself: about its priorities as a nation, and about its cohesiveness as a state. ‘I think it’s disappointing on the part of South Africa. I think the ICC’s credibility has not in any way been depreciated by what has happened, but South Africa has demonstrated that it is leaning on the wrong side of the impunity debate. Here was a classic opportunity for South Africa to comply with its obligations and comply with the court, but it has not done so. It’s a sad day more for South Africa than the ICC,’ says Allan Ngari, a researcher at the Institute for Security Studies. There are several causes for concern. The first is the lack of transparency with which the whole subject was handled. Diplomats, researchers and journalists have been asking South African officials for months to indicate how they would handle the Bashir issue, but to no avail (credit where credit is due, however: keeping a secret of this magnitude is no mean feat). If government was so sure of its legal position, why not inform the public sooner? The second, and more pressing issue, is the tension that the Bashir issue highlights between South Africa’s executive branch of government and its legislative and judicial branches. Bashir would not have travelled to South Africa without some kind of cast-iron assurance from the executive that he would not be arrested. This was a promise that the executive is not really empowered to make, precipitating a constitutional crisis of sorts. South African Parliament domesticated the Rome Statute when it adopted the Implementation of the Rome Statute of the International Criminal Court Act 27 of 2002. In other words, since 2002, the Rome Statute is not just another international treaty; it is domestic law in South Africa, and the obligations that follow cannot be dismissed without referring back to Parliament. The judiciary came into play when civil society efforts saw the Southern African Litigation Centre (SALC) submit an urgent application with the Pretoria High Court just minutes after it had been confirmed that Bashir would indeed attend. The application sought to have Bashir’s presidential immunity overturned, and for the ICC arrest warrant to be carried out. On Sunday morning, Judge Hans Fabricius issued an interim order preventing Bashir from leaving the country until the court had decided the matter. At the time of publishing, latest reports indicated that Bashir’s plane had taken off from Waterkloof airforce base shortly after noon today. ‘It doesn’t seem there has been political will on the part of the South African government [to even try to enforce the order]. Even that they are contesting the application in court so strongly demonstrates this,’ said Ngari. This is compounded by the public position taken by the ruling party, the African National Congress, in support of the decision to welcome Bashir. A statement released by the party was strongly critical of the ICC. This unexpected vehemence raises questions about how long South Africa would choose to remain a state party to the Rome Statute. And yet, despite the criticism that the South African government is receiving – much of it deserved – there is still cause for optimism in South Africa, and on the wider issue of international justice in Africa. ‘There is a plethora of different views, across the continent, on the issue of the ICC. While the AU position is uniform, it belies much diversity of opinion,’ said Kelly-Jo Bluen, a project leader at the Institute for Justice and Reconciliation. For Bluen, the Bashir visit is a reminder that there’s still plenty work to be done in this area – and that this might just be the spur needed to make it happen. ‘Many in South Africa are deeply committed to international justice, but a lot needs to be done to make the international justice architecture more equitable if we are to avoid situations like these. Negative perceptions of the ICC in Africa in many ways deflect from the real issue, which is a global power system that pushes for accountability for some and not others,’ she said. As far as South Africa is concerned, Bashir’s visit has certainly emphasised the country’s faultlines, but it also highlighted its strengths. The public outcry to arrest Bashir was driven by a well-prepared civil society movement that was determined to hold the government to account; and was supported by a strong, independent judiciary. ‘South Africa is an interesting country, in the sense that when you look at big picture issues of governance and rule of law, it is often a sum of all its parts – not driven by just one part. The parts that kick in and work are often civil society, the judiciary and the public protector,’ said Anton du Plessis, Managing Director of the Institute for Security Studies. Just how strong these parts are remains to be seen: first over the course of the rest of today, in the wake of Bashir's departure, and then over the course of the next few weeks as the courts seek explanations for why their orders were not executed, and civil society tries to generate pressure on the South African government to hold someone to account.